Making the transition from the Dark Angels Codex to Space Wolves has allowed me a little bit more freedom in building my list. Sure, I need to take a character in each force to "unlock" Terminators as Troop models, but other than that, there isn't anything else I have to take. With the flexibility in the Space Wolf squads, I was able to drop one squad down to four guys and be able to include my main character in a Land Raider when they move around the board. This gave me the chance to build a Librarian and use him "counts as" my main Space Wolf HQ (Logan). He's not as glamorous as some of my other models (like Belial) since I went rummaging through my bits box to build this guy. I only sculpted the power cables to make him look like a Librarian. I added just enough bits so that he looks that part. 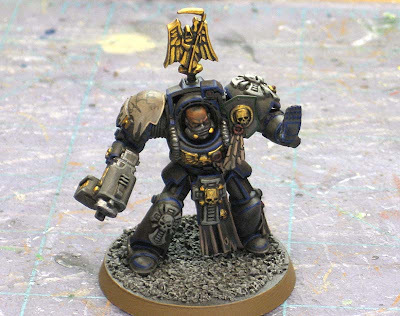 The idea was to make him a lower level Librarian that would be sent out and accompanied by a squad or two of Deathwing. I never understood why it is that the Master of the Deatwhing always had to come out in even the smallest of battles. A long time ago, when I used to play Space Hulk, there was an expansion for it called Deathwing. This introduced a few more things to the game but more importantly, had the tale of the Deathwing Squad that went back to one of their recruiting homeworlds only to find it had been taken over by a Genestealer Cult. Long story short, they decide to cleanse the place knowing they will all die and they ceremoniously paint their armour white. The picture above shows them doing this before going into battle. I've always thought this was a great image... and it's why the boys wear white today. 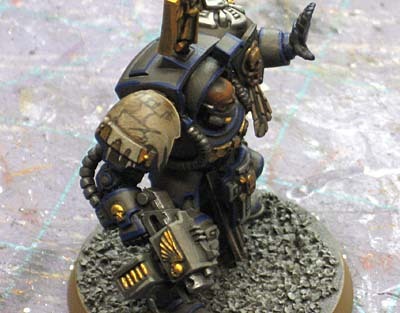 Anyway, I always wanted to paint terminator armour like this. Like it has been painted white in certain areas as part of a ceremony. While I was trying to figure out what I was going to use for my Librarian's heraldry, I decided to give this a go. And here's the result. My Librarian wearing blue armour who has painted his original heraldry over his right shoulder pad in honor of his fallen brothers. He's added his personal tribal symbol as well... Lame Bear. How fitting a name for Deathwing these days. It's the perfect way to tie him to the other models in the force and it solves the problem of painting his heraldry on his shoulder pad. 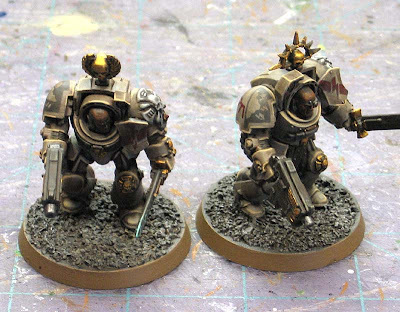 My two Sergeants have their heraldry painted on their right shoulders as well. The only models that don't are the rank and file guys. They just have the Deathwing symbol. As an added bonus, with the Space Wolves Codex, I'm able to give both of my Sergeants combi-plasma guns. How cool is that. You guys have no idea how long I've been holding onto those two guns waiting to make that change. I painted the Librarian the same way I painted the rest of my guys, grey base coat, Devlan Mud wash and line highlight the actual color. I'd consider the model a minor success, but just barely. He'll get the job done and doesn't look too bad when he's placed next to the other models in the force. I really like the painting technique and I think if I do another army some day, I might sit down and refine this a bit more so it works better visually. Until then, this will just have to do. The only change I might make would be to paint his left hand like I did the power weapons in the army with the blue/green lightning scross the surface. Imposing looking figure, Ron. I think giving it the power weapon treatment would lend credence to such a strong pose with only a non-fist hand. I imagine myself as a Guardsmen Sergeant yelling, "Watch out for that Storm Bolter boys... Oh, *#&%$! RUN!" The model is amazing, the paint job is amazing, the story is amazing. I do have one question. Why grey armor with blue highlights, is it a pseudo SW thing? It looks good, but I've never seen anything like it before. I'm curious about he thought process behind doing it. @oni - aren't Librarians normally blue? Not up to speed very much on my 40K (especially power armor armies) so I may be wrong. I think the last two posts answered eachother. The paintjob is a toned down blue paint job -yes. Love the heraldry ... not sure about the pose ... for me he looks a little 'high five'. Deathwing is one of the best bits of 40k fiction around IMO. When I painted up some DA termies I started black and worked up to white to give them the feeling they were coated in ash. Librarian looks good, and I like the rational for his 'counts as-ness' - a very good point. Also the psy-powers work for Logan's USR bestowing ability. Oni: He's a failed painting experiment really. With a little more work, I might get the technique I was using on the other guys to translate into other colors (like blue)... but in this case, it hasn't worked all that well. I think if his legs were spread wider, left arm extended a bit more and his right arm extended a bit more, he might look like he just skidded backwards. Just my opinion. Ron, why do the DA, especially the deathwing, have lots of native american accents to them? Feathers and wall art on the shoulder pads? Aren't the DA supposed to be like monks or something like that? Awesome, I love it Ron. Thanks for bringing up this old piece of fluff, I knew the story but had not seen the picture or the tribal shoulder pads before. I have a few unpainted Shoulder pads on my Deathwing that would seem perfect for this! "I can answer that mate. Its because the Deathwing in the story above were always described as being recruited from a world where the people resembled American Indians and shared elements of their culture. Indeed some say it was that world they were attempting to save." It was the same world, and at the time the Dark Angel's only recruiting world (or at least their primary one as they're all from it). 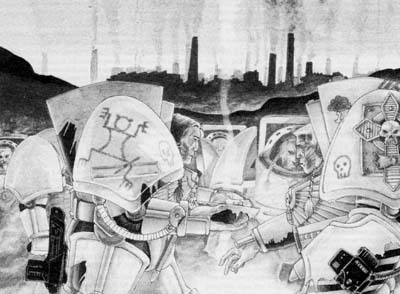 Also the story opens with Cloud Runner mourning the destruction of his home village and later Lame Bear's clan is descovered destroyed also, and then they descover evidence of the Genestealers. I really must try to get my hands on the booklet for the Deathwing expansion! What a hero! Many thanks indeed Gotthammer! Don't you just love bloggers!? Like I said, he'll work for now but there's a lot of room for improvement. I've gone back and washed him with Asrumen Blue and it's helped a good bit with getting the right value balance between the base coat/wash and highlight. I gotta say, I LOVE the gold on here. any special recipe? Or is this like the shoulderpad on the leather coat you did a bit back. Longscope: I have two ways I paint gold. This way is nothing more than just a heavy drybrush over the dark grey basecoat. I almost highlight the edges with the gold and leave the rest very dirty looking.